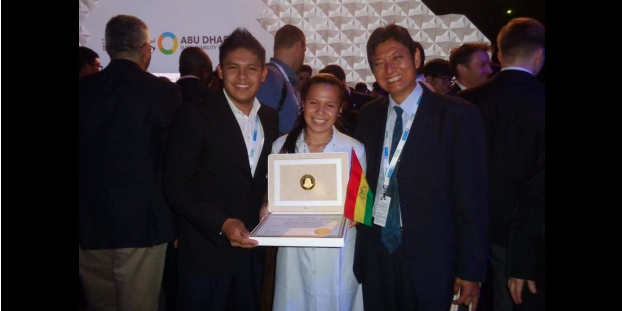 2017 Zayed Future Energy Prize winner is Bolivian! The project of San Juan de Yapacaní was awarded with $100,000 dollars and was chosen among the 15 finalists and out of a total of 1,678 nominations. A solar energy project carried out by Sacred Heart High School in the city of San Juan de Yapacaní today won the International Zayed Future Energy Award from Sheikh Mohamed bin Zayed al Nahyan, Crown Prince of Abu Dhabi. The school was awarded $100,000 dollars and was chosen among the fifteen finalists and among the total of 1,678 applications submitted for the high school category. The project will allow the supply of the school with solar energy, through the implementation of 100 panels of 25 kilowatts. The award was presented during the opening ceremony of Sustainability Week and aims to raise awareness of future generations about the importance of being responsible citizens with the environment. Sustainability Week has pavilions and exhibitors at the exhibition center in the capital of the United Arab Emirates, where it brings together more than 600 companies from 32 countries and has had 30,000 attendees. The Zayed Future Energy Prize winners were announced on Monday [01/16/2017] during Abu Dhabi Sustainability Week. There were 1,678 entries to the award this year, and in total there were 10,000 submissions and nominations made over the nine editions of the award since it kicked off in 2008. Founded in 1963, Unidad Educativa Sagrado Corazón 4 is a coeducational school in Bolivia. It is located in the town of San Juan, which has a population of 10,000 and was itself established in 1956. Funding from Zayed Future Energy Prize will enable the school to self-supply its electricity with one-hundred PV panels of 25kW (at peak demand). Savings on electricity will help strengthen a proposed educational programme on renewable energy, which will be integrated with theoretical and practical teaching methods in physics, chemistry, mathematics and agriculture. I welcome Unidad Educativa Sagrado Corazón 4, from San Juan de Yapacani to The Hall of Bolivian Fame! This entry was posted in Bolivia, Business, Energy, Environment, Santa Cruz and tagged competitiveness, education, environmental awareness. Bookmark the permalink.